Shahzad Aryobee Minister of Communications and Information Technology met with Mr. Ahmad Zaki Sarfaraz mayor of Kabul city on Monday, April 8, 2019. In this meeting the two sides had. . .
Minister of Communications and Information Technology meet with Mr. Mohammad Shoaib Sabit the governor of Farah Province. Shahzad Aryobee minister of Communications and Information Technology met with Mr. Mohammad Shoaib Sabit the governor of Farah Province On Saturday, April 6, 2019. At the meeting the. . .
Read more about Minister of Communications and Information Technology meet with Mr. Mohammad Shoaib Sabit the governor of Farah Province. Shahzad Aryobee Minister of Communications and Information Technology accompanying met with the technical authorities visited the technical sections of satellite services and evaluated. . .
Shahzad Aryobee Minister of Communications and Information Technology met with Mr. Kareem Khoja the Chief Operating Officer of the Roshan Telecommunication Company on Monday, April 1,. . . 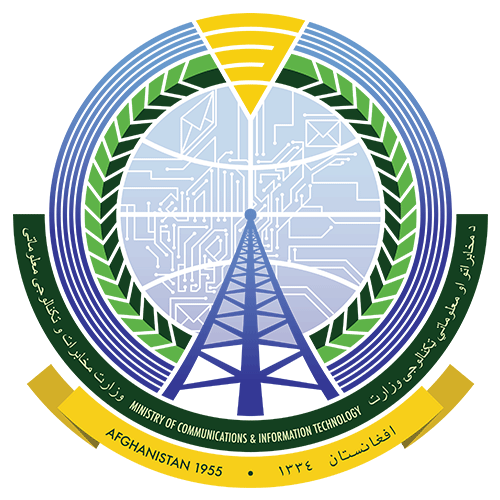 The Kunduz Department of Communications and Information Technology, in cooperation with provincial departments of ATRA, police and National Defense Security in Kunduz province,. . .
Shahzad Aryobee Minister of Communications and Information Technology started a campaign to collect non-registered and illegal SIM cards Thursday, March 28, 2019.